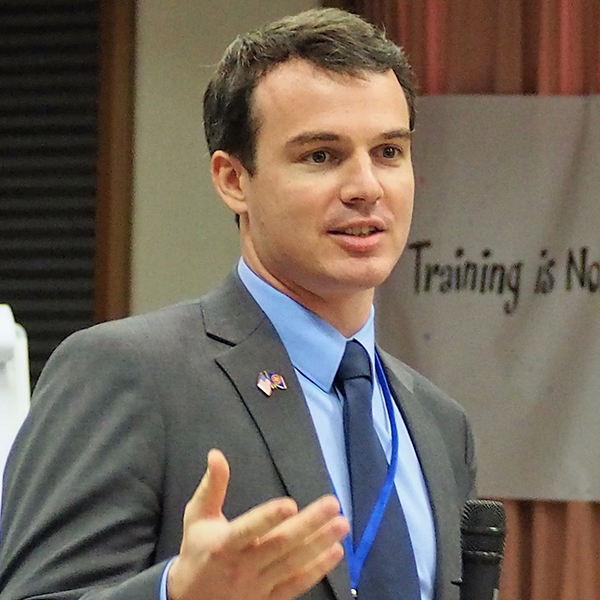 Editor’s Note: Winrock is empowering Asian farmers through mentorship and support. You never quite know where that innovation will lead. 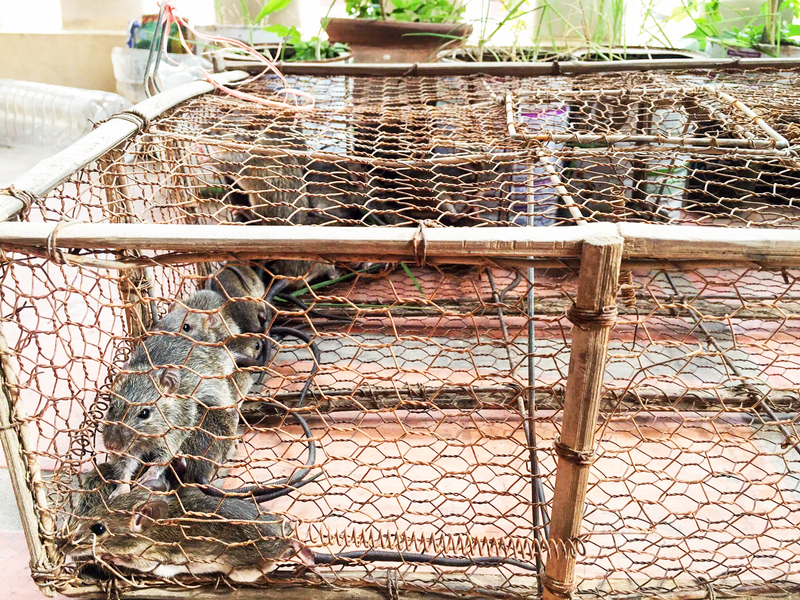 When I first met the Rat Hunter Team in Phnom Penh, Cambodia, it had some cardboard cutouts and an idea — a contraption that team members hoped would scare rats into traps alive and unharmed so they could be sent to Vietnam for human consumption. In this part of the world, rats are as big as cats, and yes, people eat them. Healthy, live specimens go for about $1 per kilo, while nicely skinned and cleaned rats fetch a little more. 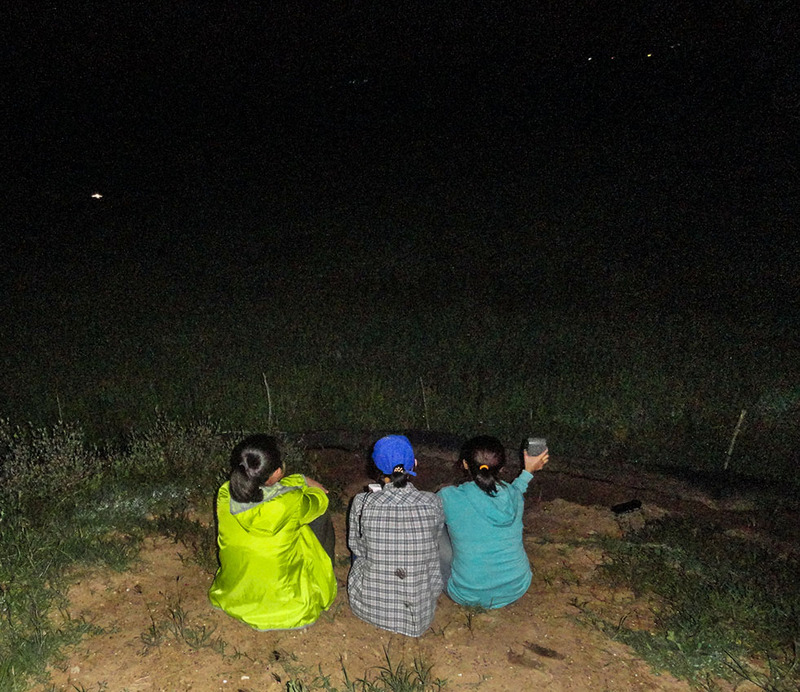 At this stage, the Rat Hunters — Likun Meas, Chanthy Leang, Rachana Phauk and Lydet Pidor (the lone male in the group) — were a longshot, up against stiff competition, including a vegetable cooler built from organic materials that is already on sale in Cambodia. Still, the judges of the Cambodian regional makerthon thought the Rat Hunter’s idea was innovative enough to award it first place. 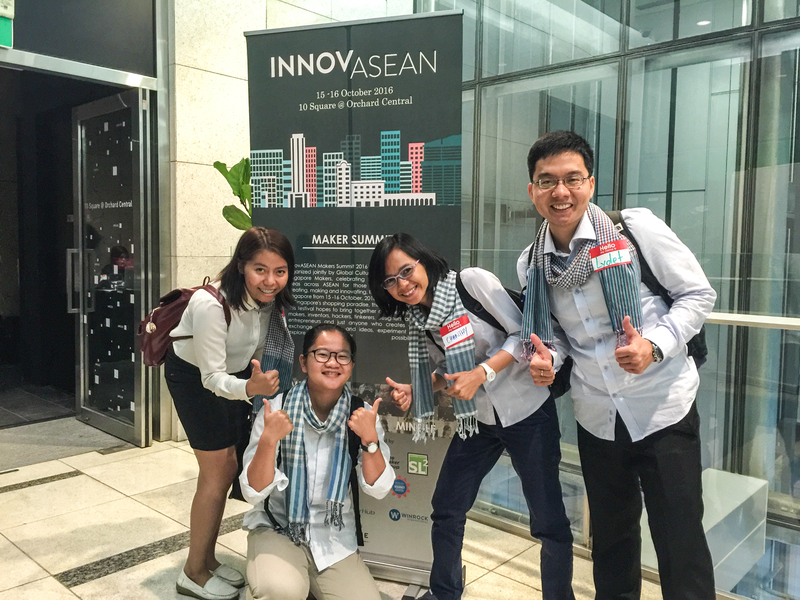 The team knew they would face fierce competition at the finals, the InnovASEAN Makers Summit in Singapore. They were Cambodia’s first team to join this regional event, organized by the Southeast Asia Makerspace Network. Other Southeast Asian cities have much more established maker movements. But the Rat Hunters had moxie. And they had help. Winrock and partner Ki Chong Tran from Arc Hub (the first 3-D printing company in Phnom Penh) agreed to mentor three teams competing in the finals in Singapore — the Rat Hunters and two teams from Vietnam. 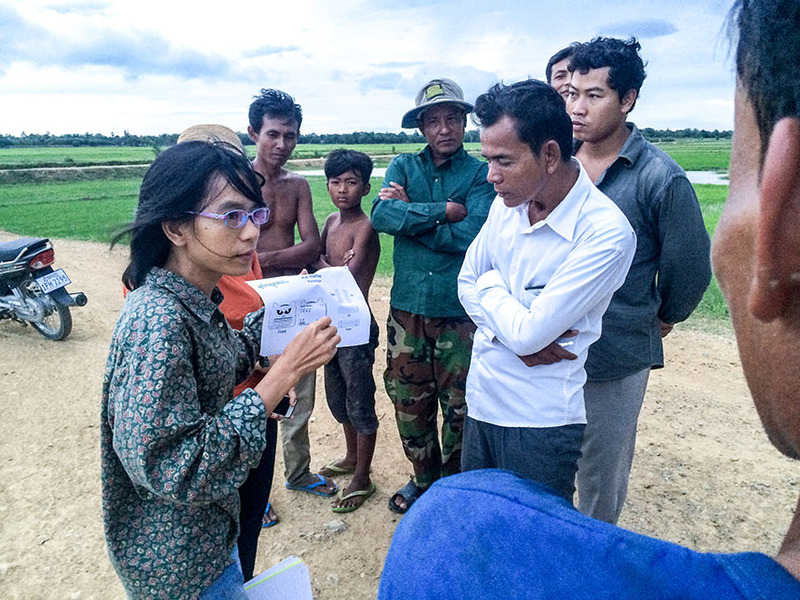 Chanthy Leang of the Rat Hunter team talks with farmers about a new way to protect their rice fields from rodents. By mid-September, Winrock’s Arkansas Regional Innovation Hub had connected with each team to advise on the advantages of lean startup, human-centered design approaches and how to ask customers open-ended questions. When the Rat Hunters did this, they learned that farmers would be willing to pay for a device if it could better help them capture the rats, which eat a sizable portion of their rice harvests. While out in the field, the team also located an indigenous rat trap made of fish netting that could be easily made by local distributors. But the Rat Hunters were still stumped on what sound would best flush the rats and send them fleeing into the trap. A snake hiss didn’t work, nor did other bells and whistles. The Rat Hunters were getting discouraged. Ki Chong and I met with them to explore options. We were in for a big surprise. The team had assembled an amazing amount of information and data about traps, rat biology and the scope of the problem facing farmers. By the end of the meeting, Ki Chong and I realized that this knowledge alone was impressive and the team just needed a roadmap. Members of the Rat Hunter team test out their new sounds. Over the weeks that followed, the Rat Hunter team went back to the field to start testing new sounds. When they tried the sound of a growling cat, the rats came running out of the field. Eureka! The team quickly developed a prototype, a device that emitted growling cat noises on one side of a field with a set of rat traps on the other side. When I asked if the rats would scatter and run in every direction, Chanthy assured me they would not. Rats run in straight lines unless they come to a wall, she said, which is why they do so well in mazes! The team priced the Rat Hunter at $40, a price smallholder farmers said was fair if the product worked as advertised. Farmers could defray some of the cost by selling the rats they caught. The Rat Hunters developed a business plan along with a series of steps to further test and develop their product. These rats were trapped during testing of the Rat Hunter product. Finally, the big day arrived. Each team was amazing, but the Rat Hunters were the most impressive. Though they started as the underdog, they worked hard and produced a crisp, knowledgeable prototype, plus a marketing strategy and business plan they could scale in just a few weeks. When they won, the entire auditorium erupted in joy. Winrock is proud of the Rat Hunters and all the teams who competed. The sky is the limit for these young entrepreneurs. Rachana Phauk, Likun Meas, Chanthy Leang and Lydet Pidor of the Rat Hunter team at the InnovASEAN Makers Summit in Singapore. The team was awarded a $1,000 first-place prize from the Southeast Asia Makerspace Network.